Campus Hall is a student dorm in the University of Southern Denmark. Image courtesy of Torben Eskerod. The complex comprises three interconnected buildings that are built on an area of 13,700m². Image courtesy of Torben Eskerod. The top floors of the student housing offer magnificent views of the surroundings as well as meeting places. Image courtesy of Torben Eskerod. Campus Hall comprises 250 well lit housing units facing the countryside. Image courtesy of Torben Eskerod. The building has been designed to promote community spirit via a common kitchen, cafes and study areas. Image courtesy of Torben Eskerod. A student’s residence hall for the University of Southern Denmark has been recently completed by C.F. Møller in Odense, Denmark. Known as the Campus Hall, the structure is spread across 13,700m² and includes 250 housing units located in three interconnected, 15-storey towers. The Campus Hall has been conceived to establish a connection between the Cortex Park, a research and knowledge park designed by the same architect in 2009, and the university grounds built in 1966. The proposal for the project was selected by the university in 2013 from among multiple options to provide an important landmark for Odense and the university campus. A donation of kr385m was made by the A.P. Møller Foundation for the project construction. "The proposal for the project was selected by the university in 2013 from among multiple options to provide an important landmark for Odense and the university campus." Landscaping services for the project were provided by C.F. Møller Landscape and engineering by Niras. The complex has been constructed to embrace a sense of strong community spirit and presents a level of complexity that is unusual for student housing buildings. Located in three linked tall towers, the Campus Hall presents a panoramic view with no front or back. It exhibits a unique shape that will highlight it within the university complex. 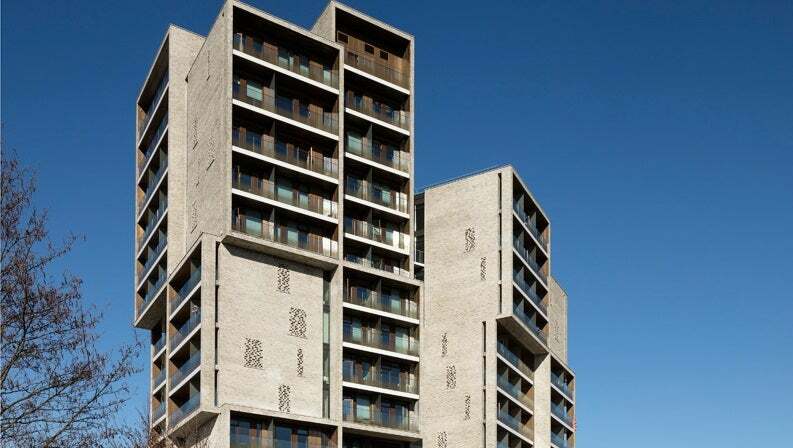 The towers are constructed using customised soft grey bricks. The student housing has been designed as a vertical residence that includes common residences on every floor, promoting interactions and echoing the university’s clear and manageable architecture. Sloping gently towards the south, the housing complex joins the science park building and its interlinked towers become a significant structure on the park’s eastern grounds. The three prominent towers revolve with regards to each other and appear at faceted angles of the park. They are connected via a common front plaza and designed to imbibe the bold linear architecture of its vicinity. The rooms in the dorm face the countryside as they are located on the outer faces of the building. The rotating form of the building ensures that the rooms provide scenic views without the invasion of privacy as views into neighbouring rooms are protected. The rooms are equipped with private, recessed balconies, making them more attractive, while providing internal shade to manage sun light. Several rooms share a common kitchen located outside in the centre making the dorm setting more collective. The kitchens have glazed facades that allow light to filter in and offer outside views from all directions. The residence offers a meeting place in the form of a shared living room that serves as a communal space for seven rooms. Shared spaces are also promoted through a ground floor café, group rooms, study and party areas on the top floors, as well as roof terraces offering spectacular views of the city and the university. The shared spaces are designed for both small and large gatherings and graded accordingly to strike a balance between the need for privacy and community sharing. The carefully sculpted landscape of the housing complex includes a park and its own lake. Punctuated by small spaces that serve as activity areas and multi-functional garden spaces, the landscape also functions as an open space for volleyball games and sitting steps. Meticulously placed in between the garden greenery are wetlands and reeds, which are connected by winding pathways. The tracks provide a link to the science park and the university allowing their visitors to enjoy the Campus Hall’s extensive green spaces. Designed from high-quality material, the complex meets the requirements of the Danish codes for low-energy class 2020. The dorm is designed to encourage a healthy approach to the environment, promoting cycling by equipping each student with a bicycle. The building exhibits a passive design through its shape and orientation and easily adapts to changes in climatic conditions. Abundant natural light, high ceilings and structural thermal mass also promote energy savings. A highly-insulated and airtight building envelope, use of natural cross-ventilation, and extensive heat recovery system for exhaust air as well as waste water and showers ensure that the building has a low carbon footprint and is in line with the required energy norms.